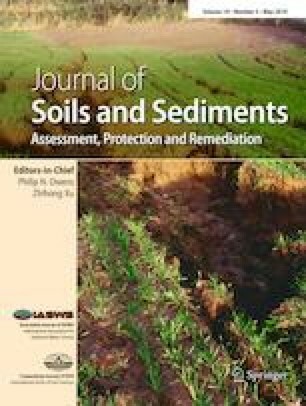 Contamination of agricultural soils with potential toxic elements (PTEs) has caused serious health and environmental concern all over the world. Therefore, eco-friendly solutions for Pb and Cu immobilization were required to minimize their mobility through various types of biochar amendments in contaminated soil. A greenhouse pot study was conducted to evaluate the comparative effect of rapeseed residue (RP), and rice straw (RS)-derived biochars, produced at different temperatures on Pb and Cu mobility and their accumulation in a high metal accumulating crop such as Chinese cabbage (Brassica chinensis L.). Sequential extraction, leaching toxicity, and phytoavailability techniques were used to assess Pb and Cu mobility. The impacts of various types of biochars on soil surface electronegative charge and soil enzymatic activity were also investigated in contaminated soil. The sequential extraction results revealed that the application of 5% of high-temperature rice straw biochar (RS550) and rapeseed residue biochar (RP550) significantly reduced the acid-soluble fractions (active fractions) of Pb and Cu by 53.50 and 50.35% respectively. Following the addition of 5% RS550, the residual fraction (stable fractions) of Pb and Cu were increased by 36.14 and 50.94% respectively. A remarkable decrease in Pb and Cu phytoavailability and solubility was observed after the soil was treated with 5% of both RS550 and RP550 biochars. In all biochar treatments, the maximum reduction of Pb concentration in roots and shoots of the cabbage was 37.81 and 26.54%, respectively, while the concentration of Cu decreased by 50.41 and 46.25%, respectively. Incorporation of biochar into contaminated soils also improved soil urease, catalase, and acid phosphatase activities as compared to the control soil. Biochar application greatly enhanced the Pb and Cu immobilization, reduced phytoavailability to Chinese cabbage, and improved soil enzymes activity. The significant increment in soil surface electronegative charges and soil pH after biochar incorporation was considered one of the Pb and Cu immobilization mechanisms. Overall, application of rice straw biochar produced at 550 °C could potentially be a safe, efficient, and sustainable approach to stabilize Pb and Cu and restore soil functions in contaminated soil. The online version of this article ( https://doi.org/10.1007/s11368-019-02250-5) contains supplementary material, which is available to authorized users. This study was financially supported by the Natural Science Foundation of China (41371470), and National Sci-Tech Support Plan (2015BAD05B02).